I have made so many sweet potatoes dishes in the last month. This is my favorite time of the year and sweet potatoes are one of my favorite fall foods. I was fortunate enough to receive a substantial amount of yams and sweet potatoes from a friend's garden. I think in total I ended up with over 20 pounds of vegetables. Thanks to this bounty of fall harvest I was able to prepare a large amount of my Thanksgiving dishes without having to spend much of anything at the grocery store. Even before I was given all the free garden goodness I had already been making a ton of sweet potato recipes. One of my favorite ways to utilize sweet potatoes is to use them in chili. 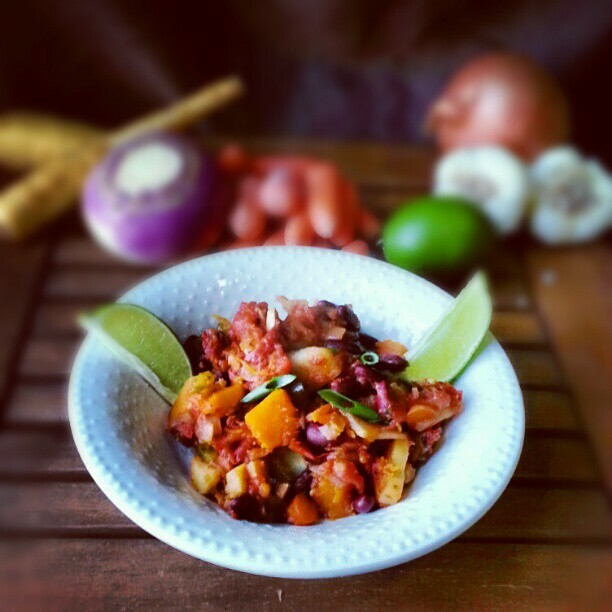 My whole family loves chili and sweet potatoes give it an additional flavor and is full of vitamins. Recently I tried a new recipe for Autumn Root Vegetable Chili from the November issue of Family Circle magazine which looked like the perfect fall vegetarian meal. This recipe has 15 ingredients. It takes 33 minutes of cooking time, 25 minutes of prep and makes 4 servings. I had no problems finding any of the ingredients at my local grocery store. This recipe is a little bit prep intensive. Since the majority of ingredients are vegetables there is a lot of peeling and cutting. One way I save time on prep is to cut all the vegetables either in the morning or on the night before. That way I only have a half an hour of cooking at dinner time. The recipe suggests a cooking time of 25 minutes. However, I felt that the sweet potatoes weren't as soft as I wanted them after that amount of cooking time, so I cooked the chili an additional 10-15 minutes. I followed the remainder of the recipe as written. I love the color on this dish. It would be a great meal to serve to guests since on the plate it looks very fall like. The flavor was mild enough that my two kids liked it, while well rounded enough that my husband and I enjoyed it. If you prefer spicier chili I would recommend increasing the chili powder to up to a teaspoon. I always adjust the amounts of spices to suit my family's needs.